Wind, water, and molten rock constantly tear apart and resculpt the natural world we live in, and people have always struggled to create structures that will permanently establish their existence on the land. Frank Golhke has committed his camera lens to documenting that fraught relationship between people and place, and this retrospective collection of his work by John Rohrbach reveals how people carve out their living spaces in the face of constant natural disruption. 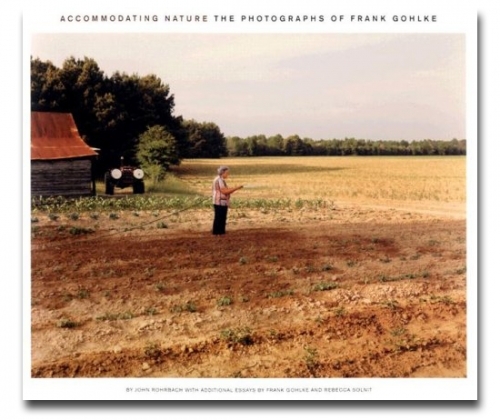 An acclaimed master of landscape photography, Golhke explores in Accommodating Nature how people configure the places where they live, work, and commune, both on an everyday level and in the aftermath of catastrophic destruction. Whether a ranch house anchored fast on an endless Texas plain, the shattered buildings and whipped trees left by a category 5 tornado, or the jagged cliffs of ash and rock created by the volcanic eruption of Mount St. Helens, the photographs unearth the ways in which new homes and lives emerge from the fragments of the old. Thought-provoking essays by Rebecca Solnit, Frank Gohlke, and John Rohrbach expand upon the issues raised by the images, contemplating the complexities of human and cultural geography and the relationships we have with our respective place. An arresting and vibrant visual essay combining magnificent vistas with intimate emotional detail, Accommodating Nature exposes the intricate threads that bind our lives to the land surrounding us.